In medium bowl, gently mix strawberries, blueberries and 4 tablespoons of the sugar. Cover; refrigerate, stirring occasionally. In small bowl, beat whipping cream with electric mixer on low speed until slightly thickened. Increase speed to medium. Slowly add 2 tablespoons of the sugar, beating until stiff peaks form. Cover; refrigerate. Separate dough into 8 biscuits. Sprinkle flour on work surface; press or roll each biscuit into 6-inch round. In 12-inch skillet, heat 2 tablespoons of the oil over medium-high heat. Add 2 biscuit rounds to skillet; cook 30 seconds to 1 minute on each side or until light golden brown. Repeat with remaining biscuit rounds, adding more oil as needed. Drain on paper towels. Sprinkle one side of the biscuit rounds with the remaining 4 tablespoons sugar. With slotted spoon, spoon 1/3 cup fruit mixture lengthwise in middle of unsugared side of each biscuit round. 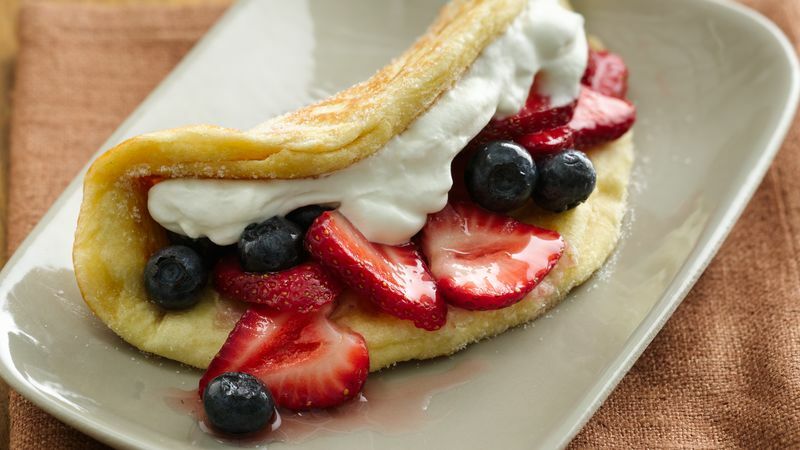 Spoon rounded 1/4 cup whipped cream along outside edge of fruit; fold biscuit round over to form taco. Serve immediately.